ALTHOUGH WE might be surrounded by snow, Henry Herbert, as a scootering tailor service, won’t let that stop us reaching our customers…..we just have to wrap up……a lot! Pictured is Charlie, the creator of Henry Herbert Tailors. As with all of our scootering tailors, we dress appropriately for the weather and in the snow we put on our reflective and heated body suits (see more about heated motorcycle clothing here), we wear motorcycle snow boots and two pairs of gloves. The snow hasn’t defeated us yet! 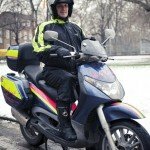 A small company in London, called Dashing Tweeds, offers a beautiful, waterproof Tweed jacket for scooter drivers. They are stunning, but a bit too expensive for us unfortunately. See also: body suits, Charlie, Henry Herbert, Henry Herbert Tailors, London, motorcycle, snow, snow boots, tweed jacket. Henry Herbert tailors keep trooping through the snow!.